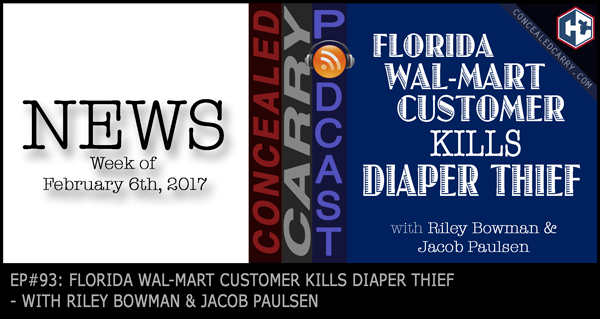 Riley and Jacob cover some important stories about proposed laws being debated in various states plus highlight an extremely intriquing JUSTIFIED story where one Wal-Mart customer has to draw and shoot another customer when confronted over stolen diapers. Lot's of important and interesting analysis on this type of situation. Also in another JUSTIFIED story we point out some of the legal consequences that can result when you refuse to talk to police AND when you decide to go out and confront someone OUTSIDE OF YOUR HOME! We are still getting ready to celebrate our 1-year anniversary since launching the podcast, and we are giving away a bunch of great prizes! Listen in for how to enter the giveaway!! Whether the customer should or should not have gotten involved in helping to stop the theft; When the suspect reacted with an “apparent” threat the whole situation changed. Now the customer is protecting himself. Should he have stood there and possibly been injured or killed? The suspect escalated the incident. It’s a shame somebody had to die over diapers but that was his choice too. I used to be a Security Officer. for a major chain dept. store. I still have scars from that. I took every conceivable kind of weapon from shoplifters from case cutters, afro combs, guns, etc. It can be a dangerous job and some people out there will kill to escape.